Skin cancer can appear decades after a sunburn, or from accumulated sun exposure. UV exposure damages the DNA in the skin leading to skin cancer. Non Melanoma Skin Cancer includes Basal Cell carcinoma (>2/3 of skin cancers) and Squamous cell carcinoma. NMSC accounts for about 1% cancer deaths but is a major public health concern because of its high incidence and the impact on the health system. Both basal cell and squamous cell cancers mainly occur on areas of the skin frequently exposed to the sun, however they may occur elsewhere requiring full skin examination. BCC are the most common form of non melanoma skin cancer. BCC are less dangerous than Squmous cell carcinoma and Melanoma. Early non aggressive forms of BCC can be treated with surgical and non surgical techniques. 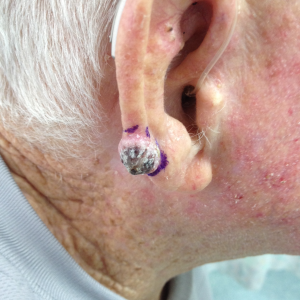 Basal cell carcinoma may appear as a small, smooth, pearly bump on the face, ears, or neck. They may also appear as flat, pink lesions on the trunk or arms and legs. Early detection of BCC may allow less invasive treatment techniques to be used. Squamous cell carcinoma are directly related to accumulated sun exposure/damage. 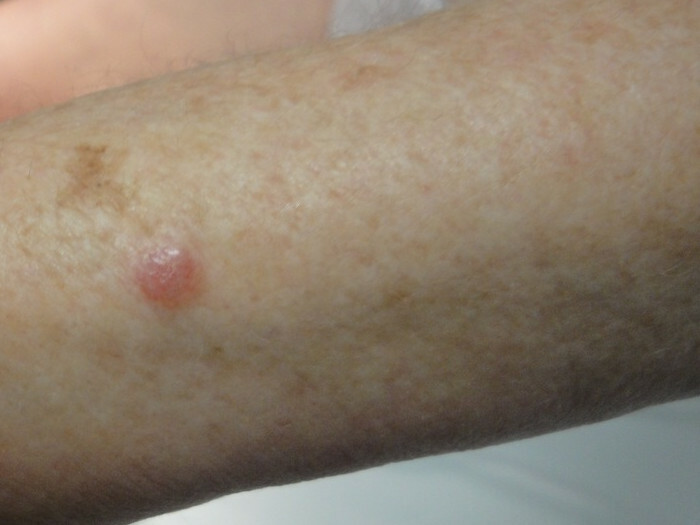 Squamous cell carcinoma may appear as a firm and tender papule or nodule. They may also appear as a scaling plaque especially on the arms and legs. Like BCC suspicion is raised when a persistent lesion itches, bleeds or progressively becomes crusted and ulcerated. Numerous treatments exist for various forms of basal cell and squamous cell carcinomas. Usually squamous cell carcinoma (SCC) and aggressive Basal Cell Carcinoma requires surgical excision to obtain acceptable cure rates. In addition to Surgery there are several Non Surgical options that may be used to managenon melanoma skin cancer. Ongoing skin assessements for further skin cancer. After a thorough assessment your dermatologist (a specialist in the treatment of non melanoma skin cancer) can advise you regarding the best course of treatment.